Can Kadri Follow in Pacioretty's Footsteps? | Five Minutes For Fighting Five Minutes For Fighting: Can Kadri Follow in Pacioretty's Footsteps? Another training camp, another unflattering Nazem Kadri story. This time, however, it wasn't even at Maple Leafs camp. On the opening day of the Marlies' training camp, head coach Dallas Eakins answered a reporter's question about Kadri's fitness levels (supposedly better after an off-season training with Gary Roberts) and responded that he was in the bottom 3-5 in camp. He was also described as being "average" on a number of fitness drills. Not the type of story to start the year. Now Leafs fans are worrying over the former seventh overall pick's development, wondering if he is another bust in a long line of Toronto draft disappointments. It wasn't long ago that further east along the 401 Montreal Canadiens fans were similarly fretting about one of their own top prospects. Max Pacioretty, like Kadri, was a first round pick, although he was taken later in the first round (22nd overall). Just like Kadri, Pacioretty failed to make the NHL immediately after being drafted, instead hitting the books and going back to college for a year. Once turning professional, he also was yo-yo'd back and forth between the AHL and NHL, although not to the same degree as Kadri. Now, after years of fan agony, Pacioretty has finally established himself as a top-line winger, something Kadri has yet to do. But the Montreal left winger's slow ascent should give hope to many waiting for Kadri to similarly fill his promise. Leafs fans can learn something from Max Pacioretty's development. Pacioretty made the Canadiens out of training camp in 2009, after one professional season (71 combined AHL/NHL games) under his belt. He struggled mightily through 52 games, scoring a mere 14 points, and was demoted to the AHL in Janurary 2010. Pacioretty's eroding confidence must have lingered, because he began scoring at a worse rate in his second AHL stint. At this point Pacioretty had a total of 19 points in 86 NHL games and 40 points in 55 AHL games. Nothing that really suggested he was ready to become a full-time NHLer. But he was still the team's top forward prospect, and at the end of the 2009 season many believed he would win a job with the Habs during the 2010 training camp. He didn't. But after putting up more than a point a game in the AHL, he was banging on the door, and the team recalled him in December. Once with the big club, it was clear that all the time spent in the minor leagues had finally paid off. Pacioretty was scoring at close to a 55-point pace, and would have flirted with 30 goals over a full season. Famously, Zdeno Chara almost ended his career that season, but Pacioretty didn't feel any long-term effects as he firmly entrenched himself as a top-line winger the next season, scoring 33 goals and adding 32 assists. That was his fifth year after being drafted. The first four years he either spent in college or bouncing back and forth between Hamilton and Montreal. Sound familiar? Now let's take a look at how both prospects fared each year after being drafted. NHL: 24 pts/37 gms ? 5 NHL: 65 pts/79 gms ? Each year, across both professional levels, Kadri was outscoring Pacioretty. If Kadri follows a similar trajectory as Pacioretty, he wouldn't even make the Maple Leafs out of training camp this year. And thanks to the lockout, he won't. He too will spend his fourth year after being drafted in the AHL. So all is not lost for Kadri. Pacioretty is one example of a very gifted hockey player that took a little longer than usual to make the NHL. The fact that he did it in the hockey hot-bed of Montreal makes the comparison even more apt. 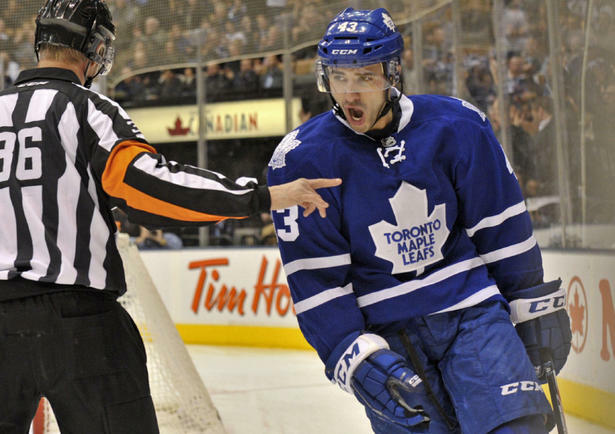 The true test will be whether Kadri can stick with the club once (if) the NHL resumes operations sometime this year. At this point, either you view Kadri as the Maple Leafs version of Travis Snider, a talented prospect who will never pan out and who will be traded once his value has severely eroded, or you see him still holding a glimmer of hope. It isn't much, but Max Pacioretty is a reason why you should keep that hope.